Today is my mother’s 60th birthday. She is still as beautiful as ever and actually looked 10 years younger for her age. I have always been proud of my mother (and my father too, of course. But this post is not about him). 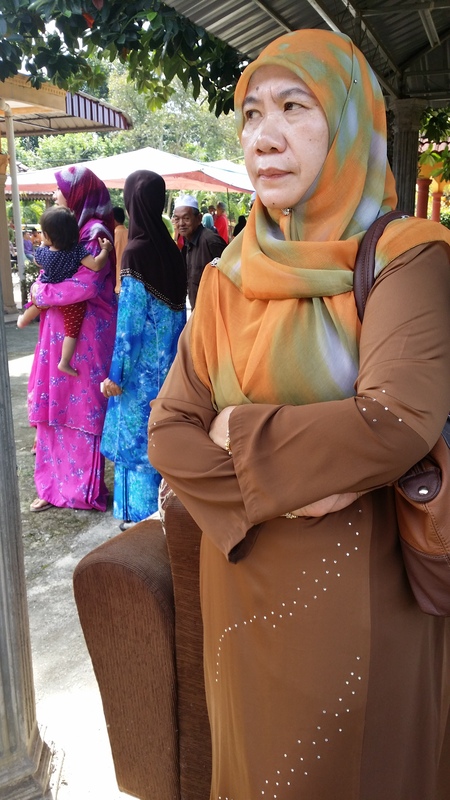 Every time she came to school to take my report card from my class teacher, I would smile to the ear when my friends said “Cantiklah mak Afiza.” I always like walking around with her because I know that I have a beautiful mother. Her skin is very fair that people always thought that she was Chinese when she was younger and did not yet put on the hijab. When I walked around with my mother around town, some Chinese would stop us and talk to my mother in Chinese until my mother had to tell them that she was actually a Malay. All my relatives from my mother’s side of the family look like Chinese. We always wondered whether we have some Chinese ancestry on my mother’s side. My maternal great grandparents came from Indonesia to teach the religion in the early 1900s, and thus we are not entirely sure about the details of our ancestry from Indonesia. My mother must feel some despair at times that all of us took up after our father so much more than hers. We all look like our father. We behave like him (because he is dominant in the house). We are not as concerned with convention and tradition as her (because our father encourage that tendency in us). My mother is really very conventional. She feels anxious at everything that doesn’t follow the norms. When I was a HO and had done the unthinkable by writing disparagingly about one particular department in my hospital (and then it went viral accidentally), my mother was worried sick. I just shrugged my shoulder and looked at my father. My father said “Tak apa. Kita pun boleh saman balik. Biarlah, dia tulis benda betul. Tok sah takut. Yang penting kita buat tanggungjawab kita, pi kerja macam biasa. Kita kerja untuk pesakit sebab kita dibayar gaji. Bukan kerja untuk boss. Tengok apa depa boleh buat pun” My father said. I immediately felt relieved that my father understood and supported me. You see, I can always count on my father for that sort of support…support against unjust authority is sure to gain his approval and he is sure to back you up. It’s been that way since I was a little girl. I had very little fear after my father said that. That’s not to say that my mother is not supportive of me. She just thinks differently. But no matter how different she thinks and feels about stuff, when all chips are down, her support is ever constant, ever remaining. When I was a HO, I never went to work hungry. Even when I went out for morning rounds at 5.00 am, I would still go to work with my stomach full. My mother would wake up earlier than me to prepare breakfast for me. When I was oncall, she would come to the hospital, bringing me food. When other HOs had lost weight during the earlier part of their housemanship, I instead had gained 5 kgs. Hahha. Before I bought my car, she was the one who acted as my chauffeur day in and day out. She woke up and went to sleep at about the same time I did. She took care of me even better than when I was in secondary school because she had already stopped working by the time I started my housemanship and she had all the free time in the world to mother me properly. I don’t know how other people did their housemanship without a mother around. My mother was an immense source of support for me. No matter how traditional and conventional she is, she would give it up when I insist. When I was 12 year old, we wanted to do a kenduri khatam Quran for me. My mother planned to serve pulut kuning and air sirap and some other side dishes for the kenduri at the local surau where I learned my Quranic recitation. But I was not appreciative of her plan. I told her “Angah tak mau pulut kuning dengan air sirap. Tak sedap. Angah nak bihun goreng dengan air Coke.” I told her in my characteristically opinionated manner. As usual, my conventional mother was not pleased that I wanted something different than the usual dishes served for such momentous occasion. But at that time, I was thinking that: “This is MY majlis khatam Quran. I want to eat what I like. I don’t like gulai and pulut kuning. And as for air sirap…I had hated it ever since Kak Long had once cracked a joke about how air sirap was actually diluted blood. (Hahaha!). Because me and my mother could not agree about the food, we went to my father. My father then decided that I should get what I wanted: Bihun goreng and Coke. My father reasoned the way I did: because it was MY kenduri and it was a celebration of MY achievement, and thus I should get what I wanted. My mother, though worried and displeased, finally consented to the plan and I finally got my bihun and Coke. And guess what….kids always enjoy bihun goreng and Coke heaps more than pulut kuning and air sirap. I mean, just talk to the kids. We like sweet, unhealthy things like Coke, right? And bihun goreng pedas-pedas makan dengan Coke yang bergas…hello! Of course we prefer those! All my friends said that my kenduri khatam Quran was the most delicious than any other kenduri before. I told my mother what my friends said and she was happy and relieved. So truly, what ever propriety and good manners that I have, they all belonged to the insistence and teachings of my mother. My mother would always comment about my attire, about what I should wear, about how I haven’t worn the baju kurung she bought me (and therefore she would never again buy me anything else, she said… but then she would end up buying me the same stuff again and again in the hopes that I would wear it. Hahha) My mother gave me all the proper conventions that I have now. And my father gave me all the radical beliefs that I possess. Between the two of them, they balanced each other and gave us balanced perspective. But of course, me being me, I tend to skew towards radicalism than convention. My mother is also the buffer in any fight I have with my father. (Me and my father have our moments of truce and our moments of war.) Me and my father fought a lot. Because we are very similar, we tend to rub off against each other. He believed what he believed and I believed what I believed. We BOTH wanted to convert one another to our set of belief system. My mother would watch our verbal arguments in a concerned frown. At last she would say, “Ayah tak payah mengata kat kak ngah. Kak Ngah pun tak payah kata kat ayah. Dua-dua orang sama! Sudah!” And we would quit arguing when she said that. At that moment, we did not appreciate being said that we were similar to each other. Hahah. My mother is a strong woman. If you are married to my father, you must be. There is a balancing art to it. How to please his fussy fastidious ways but at the same time retain the core integral part of your personality. That is hard. I don’t have the same gentle ways that she has. As gentle as she was, my mother was expected to become the enforcer of my father’s disciplinary ways. Sometimes, even when she disagreed to the discipline. So, she was stuck in the middle. She pretended not to know some of our crazy misdeeds because if she appeared as though she knew about it, she would have no choice but to enforce the rule. “You know, kak ngah…I think all those years when we thought our parents had no idea what we were up to….when we were kids..” My Kak Long said one day in one of our phone conversation. Kids are honest creatures not because they never lied. It’s because when they do lie, it’s obvious. Me and Kak Long lied a lot when we were kids. We pretended to read academic books instead of the real fiction tucked underneath our bigger text book. We watched TV when our parents were not around, and then scrambled quickly to switch off the TV and ran to the study room when we heard the sound of the car engine outside, signalling that my parents have come home (Thanks to Kak Milah, our pengasuh who was so conspiratorial about it. Hahah. I love her still). When our parents looked in on us, we looked so innocently studious in the study room, the perfect epitome of hardworking angels. “Awat kipas memusing kat luar. TV pun panas ja.” (Yup, we forgot to switch off the fan. And we were caught by surprise that my father would bother to feel up the TV. Damn it. Busted!). I knew a stroke of rattan would be waiting for me if I was late. But sometimes me and my Kak Long risked the consequences because we wanted to go on playing. “Kami tak ambil rotan. Jatuh belakang almari kot.” I said. You have no idea how many times the rattan fell over to the other side of the heavy bookshelf, making it unreachable to my father. We always thought he bought the act. All those times we thought we got away from punishments because our parents didn’t know….now I knew better. Now, I think they must have known. When we were kids, we thought it was our cleverness that got us away from undesirable consequences. But actually, it was their love and mercy. They pretended to not know so that they wouldn’t have to administer the punishment they said they would give if we had committed something bad. Yeah, we would ask straight from our father for academic books, stuff for school and anything in the serious realm. But for anything frivolous or playful or trivial, we were scared to face the rejection if we were to ask them from our father. When I started studying away from home, my father would give an allowance for me that he thought should last long enough until the next time I came home for school break. My father always said that I was the most ‘boros’ of all his children. He wanted to teach me a hard lesson about economy for so long….he said “Habis duit awal, ayah tak tambah dah.” He always said that ever since I could remember. But of course my mother would give me more money each time, outside the knowledge of my father. “Jangan habaq kat ayah,” She would whisper to my ear. I rarely run out of money…but my mother always thought that I would not be able to keep within the budget in view of my boros reputation in the family (I bought books, food, books and books. Hihihi) So she would automatically give more to me even when I didn’t ask for it. My mother is a busy woman. She woke up before fajr for all the sunat prayers, then she went to the mosque and attended the subuh sermon. Then she would prepare breakfast for my father and do the daily housechores. Then she would pray the Dhuha prayer and then she would cook lunch. And she would attend a lot of classes. Every day there are classes at the mosque. She has her schedule full of activities even during the weekend. She told my sisters clearly, “Mak tak jaga cucu hari-hari. Mak tak mau jadi macam kawan mak. Nak pi ke mana pun tak boleh asyik nak kena jaga cucu. Anak-anak dia ni tak kesian kot kat mak depa asyik penat jaga cucu; sampai nak buat apa pun tak boleh. Mak nak seronok-seronok main dengan cucu bila-bila mak nak. Tapi tak mau nak kena jaga selalu. Hangpa pandai-pandai cari nursery or orang gaji. Zaman jaga budak-budak ni dah berlalu untuk mak. La ni, mak nak rehat dan beribadat.” And I applauded her decision. My mother has no problem with straight-talking when she feels like it. Hahah. Like her, I never knew how people get bored. I always have things to do. I don’t even have time to be bored. I fulfil my friends’ request for hanging out for their sake rather than for mine. I feel close to them regardless of whether or not we meet frequently. But some people need rituals and traditions to cement a connection. I don’t. If I like you and consider you as a friend, I don’t need frequent catching up to feel like our friendship is still meaningful. But I have learned to accommodate that sort of request over the years. The truth is I lead a busy life, myself. I come back from work, feed my cat, water my plants, go for a jog, perform my Maghrib and Isya prayer, and then I have to STUDY! And after I go to sleep, the next day I have to go to work and the same cycle repeat itself over and over again. During the time when I do have free time, I would read thrillers/novels/mysteries/literatures….or I would write an essay, compose a poem or I would blog. WHEN do I have the time to be bored? Never! Like her, I am very self-contained. The gift of never being bored is something I inherited from her. And we both were described by our friends as aloof and unapproachable at first but after getting to know us better, that impression would change. That is totally something both of us share. Being called ‘muka sombong’ is something I got from her. My father teased my mother about it frequently. Now, the internet has invented a term for that sort of thing. It’s called BRF (bitchy resting face). Hahah. And we predicted that Aayra (my niece) has all the potential to inherit the same BRF tendency. Happy 60th Birthday, Mother. Your daughter here is everlastingly grateful for the privilege of being able to call you her most beloved mother. In your hands, gentleness becomes strength rather than weakness. In your hands, patience becomes courage rather than cowardice. You are The Incomparable among everyone I have ever laid eyes on in this life. Thank you for dealing with my difficult, slow-to-warm-up phase of childhood. Thank you for dealing with my temper tantrums when I was a teenager. Thank you for always having my back even when you disagree with me. Your support means the whole world to me even if I may not know how to display the sentiment properly. May Allah bless you with His Mercy and His Love always, forever…to the hereafter. Amin. I remain, your adorably loving daughter. Take a look at this picture. Look at the colourful apparel of traditional dresses and baju kurungs worn by these beautiful ladies. Do they look happy or somber? Where do you think this pic was taken? At a wedding or at a funeral? In the past one month, I lost two relatives who I was quite closely acquainted to as a child (or rather, as closely acquainted as only a frivolous, fun-loving, carefree child can be). As our respective nucleus family grew in numbers, we slowly drifted apart and rarely saw one another. As the years passed, my parents rarely visited other branches of the family as they used to do during Eid or any festivals because my parents nowadays have their own grandchildren who they eagerly wait upon at our own house. Slowly but surely, the growth of our family relationship were stunted. And when we did see one another every other year, the conversation were stilted, forced and sometimes, quite painful to endure. Slowly but surely, we lost common ground and found nothing to say of any importance to one another beyond the usual mundane small talk (that I never pretend to be good at). Slowly but surely, I forgot all cousins I used to know and became ignorant of any new additional cousins I might have acquired over the years. It didn’t help that my mother was the youngest in her family, and thus most of my cousins are at HER age than mine. While my father – being from a broken family – was the only child being raised by my grandfather; he rarely saw his own mother (who had passed on years ago) or his other siblings (raised by his estranged mother) until he was quite old. But the fond memories I have – of having received affectionate kisses at each visit and of receiving lots of Eid money from my paternal great-Aunt and my maternal elderly aunt; they both recently passed away– are something I will always cherish as part of my lovely childhood upbringing. I mourned their passing. But you wouldn’t know it when you see me. In fact, you wouldn’t know their close family members are mourning too if you don’t actively ask for their symptoms of grieving. It didn’t show in their smiling face. Or in the clothes they were wearing on the funeral. Or in the calm, serene manner they nodded their thanks to condolence-wishers. Or in the quiet way they continued to organize the funerals in as efficient a manner as possible. As a kid, I used to equate death with great sadness. And I used to feel enormous discomfort at having to attend a funeral, because…I didn’t know what to say at the face of their great loss. Because I felt guilty that I didn’t feel sad when they must be feeling utterly devastated. I felt emotionally-deficient. I thought whatever I said would not be enough. I struggled to say something appropriate and ended up not saying anything at all. But actually, I really wasn’t expected to say anything at all. As a kid, I didn’t know that. I was wrong to think that what I saw on TV were what really happened in real life. And as a kid, (having some diluted Indian blood on my father’s side) I was raised with a lot of Hindi movies. Andaz, Sangam, Yaadon Ki Barat, Aa Gale Lag Jaa, Bobby, Kati Patang, An Evening In Paris, Love in Tokyo….I watched them all as a kid. My sisters and I memorized Hindi songs as a child, can you believe it? As a kid, I saw on TV that people cried until their eyes were noticeably red; they didn’t smile even a little bit on the day their loved ones died; sometimes they fainted altogether. At times, they wailed inconsolably. Some of them stopped eating, grew weaker and finally died (perhaps happily, as they get to follow their loved ones into the hereafter). As a kid, I felt really uncomfortable being dragged into a funeral because I – by nature – don’t like awkward situations where people feel sad and I feel inadequate to do anything about it. Because I thought that they would act the way I saw the actors acted on TV. Just thinking about witnessing what I saw on TV for real, made me shudder. (2:156): “Inna lil-laahi wa innaa ilayhi raaji’oon [Truly! To Allâh we belong and truly, to Him we shall return.]”. You are not expected to express great grief ad nauseum, ad infinitum. In fact, wailing is prohibited. – You don’t keep the body for a few days. – It is recommended that the burial service is done as soon as possible. If your loved ones die in the morning, they are usually buried around noon on the very same day. – Closure is hastened, so that the relatives can move on faster and don’t wallow in self-pity. 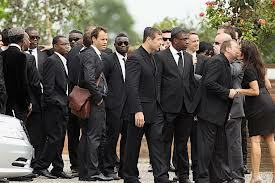 2) There are no specific dress code or colour for mourning beyond the usual guidelines on modesty. -The first picture in this article is of my mother in her usual outfit, attending the funeral of my paternal great-aunt yesterday. Look at the others in the picture. They, too, didn’t wear somber black or grey. -Nor are you allowed to tear at your clothes or slapped at your cheeks. – We are not allowed to GLORIFY sadness, to a degree of good play-acting on TV. – It DOESN’T mean that you are not allowed to cry at all. You may cry but not because you blame God or fate; you shouldn’t cry as a way of saying “he shouldn’t have died. It’s not fair that he died. I want to die with him. I have lost the meaning of my life without him”…and on and on you go. -We are taught – deeply ingrained in our psyche – that upon seeing our loved ones are dying, our uppermost religious duty at that very crucial moment is to prompt our loved ones to say “Laa Ilaha Illallah.” (There is No Other God but The ONE God). -That sacred words reflect our whole purpose of life in this world – worshiping none other but Him – and we are ambitious of dying with those words as our very last utterance. -Knowing that fact, knowing that it is every Muslim’s need to die with those words on their lips… the most practical thing for relatives to do is to help their loved ones do so, and with very minimal drama. 5) The official period of mourning is three days. The sadness may last forever. But life must go on. -Fake it till you make it. – You are sad and things are not yet normal for you. But fake normalcy first, then you will attain it, insya Allah. “The real patience is at the first stroke of calamity” says our Prophet (pbuh). Translated to Malay: “Sabar itu adalah pada kejutan yang pertama”. As a kid, I was pretty stupid. I thought that my inability to have prolonged crying MUST meant that I probably did not feel enough; and that made me feel guilty. But the fact is such that the ‘prolonged crying’ and the ‘pathological grief’ glorified on TV is UNNATURAL. The TV is only playing with your emotion; wanting you to think that the harder the actor cries, the more loving he/she really is towards the dead. In any case, there are times when you feel TOO MUCH to cry. Your grief is too private to share. Your sadness is too sincere to show. As an adult now, I applauded my relatives for being very serene, calm and dignified. They cried for a bit, then they greeted guests, smiled at them, talked about practical matters, put on as normal an appearance as they can muster, and the next few days, they are back to normal routine (at least, outwardly). And as a result, I have stopped feeling awkward about attending funerals. I know now that the dread that I felt about funerals as a kid was not at all realistic. I don’t have to say anything. People are not going to cry in front of me. If they say something, I only have to listen. I don’t have to say “Moga bersabar”, thinking that I sound really fake. In fact, I don’t have to say anything at all if I don’t want to. I don’t have to fake a greater emotion than I actually feel. All I have to do is attend and be there, and pay my respect and pray the Solat Jenazah. In facing the death of loved ones, the Muslims are religiously taught to jump straight to acceptance and say “To Allah we belong, and Truly, to Him we shall return” upon hearing any news of death or calamity. I don’t mean to say that we skipped the whole “denial, anger, bargaining, depression’ parts. But we are expected to hasten the whole process of getting to ‘acceptance’ in a matter of seconds, at least outwardly. And the five stages of grief, do not necessarily follow one stage after another the way they are arranged. The stages of grief sometimes do not follow any particular order at all. They may later say “if only we had gone to the hospital sooner” (bargaining stage). They may later become angry and want to sue the hospital (anger stage) and so on and so forth. But the death itself is accepted, first. You deal with the other stages, if and as, they come. As a Psychiatry MO, I am not saying that it is not okay to grief, at all. I am not saying religious people don’t get depression at all, because they do. I am not saying that it is religiously wrong to get depressed, because it is not. It is a disease (depression has genetic component as well) and with treatment, your depression will go away, insya Allah. In fact if you have depression, it can be seen as a test from Allah and as a means to elevate your status in His eyes. Dr. Nassir Ghaemi (a noted Professor of Psychiatry from Harvard University) said in his book titled ‘A First-Rate Madness’, that those who successfully overcome their depression, end up with more resilience than their so-called ‘normal’ counterparts. And if you have gone through ‘many emotional upheavals and difficulties’ in your younger days, it has a ‘steeling’ effect that will make you more prepared for other emotional challenges in your more mature years. Abraham Lincoln, Martin Luther King, Mahatma Gandhi… are some of the leaders who Professor Nassir Ghaemi had posthumously diagnosed as having had depression in their younger days and it made them a better, more emphatic person and a great leader. So depression can be viewed as a ‘mind vaccine’. ’What doesn’t kill makes you stronger’ kind of concept. It is not wrong to be depressed. But I am just saying that, as a Muslim, I recognized parts of my Islamic teaching that are protective against pathological grief or depression. And my recent experience of having lost my relatives and seeing how their family members deal with it, reinforced my gratitude to Allah for prohibiting us from glorifying and dramatizing sadness or grief. Alhamdulillah. May Allah S.W.T have mercy on BOTH the soul of my Tok Wa and my mak ngah. Amin. This post is going to be in Bahasa Melayu because it is very important. Fair, right? Everybody in Malaysia can understand Malay (or they should be able to; this is after all, Malaysia, where the Malay language is the official language). Whereas not every Malay, Indian, Chinese, Sabahan, Sarawakian etc etc has a good command in English. This is important! Especially to every Malaysian women! To a lesser extent, this post is also for Malaysian men. Don’t be offended. This post is meant for the benefit of your wives, your sisters, your daughters, your nieces. For their sake, please think of what I have written carefully. Sewaktu saya berada di University of Newcastle, saya pernah memegang jawatan sebagaibendahari UNIS (University of Newcastle Islamic Society) selama setahun. Dan di sana, UNIS pernah menganjurkan Minggu Kesedaran Islam (Islamic Awareness Week) di mana kami mendirikan sebuah khemah lengkap dengan risalah-risalah dan Terjemahan Al-Quran versi bahasa Inggeris yang kami berikan secara percuma kepada sesiapa sahaja pelajar-pelajar universiti yang berminat terhadap Islam. Kami juga menyediakan jadual bagi memastikan khemah tersebut sentiasa dijaga oleh ahli-ahli UNIS bagi membolehkan kami memberi penerangan dan menjawab soalan-soalan yang dikemukakan oleh matsalleh-matsalleh di sana. Pada hari giliran saya menjaga khemah tersebut, seorang wanita Australia menyapa saya di sana dan bertanya mengenai hak-hak wanita di dalam Islam (salah satu soalan yang kami sememangnya telah bersedia menjawabnya). Dengan lancar dan teratur, mulut saya mengeluarkan pelbagai hujah mengapa ‘the value of women in Islam is not half of that of men.’ Skripnya telah siap terhafal di dalam otak saya; tidak perlu saya tergagap-gagap mencari jawab. Memang kami sudah agak; soalan ini bakal menjadi soalan terhangat di kalangan non-Muslims. Sungguh, saya begitu bangga menyatakan bahawa lelaki Muslim adalah lelaki yang sejati. Kemudian saya pulang ke Malaysia. Menjadi seorang doktor adalah suatu pekerjaan yang diberikan keistimewaan tertentu. Kami seolah-olah diberi hak untuk bertanya dan mengorek rahsia orang awam yang mungkin mereka tidak akan ceritakan hatta kepada rakan baik mereka sekalipun. Kami bertanya dan mereka menjawab; dengan harapan doktor dapat membantu. Di samping merawat masalah kesihatan mereka, kami tidak dapat lari daripada mengetahui tentang masalah sosioekonomi mereka. Penggiat filem dan drama pastinya dapat memperolehi lambakan idea dan inspirasi untuk menghasilkan karya terkini bermutu tinggi sekiranya mereka membuat kajian mereka di hospital. 1)Seorang ibu yang ditinggalkan di hospital walaupun dia sepatutnya sudah dibenarkan pulang. “Anak makcik tak ada ke?” Tanya doktor. Makcik tak terkata apa. Hanya mata berkaca menghambat sayu di jiwa. 2)Seorang ibu yang masih disayangi dan dijaga – tapi hanya oleh anak perempuannya yang telah diceraikan suami. Anak lelaki? Entah lesap pi mana. 3)Seorang isteri yang setia menjaga pesakit (yang merupakan suaminya) telah diherdik kerana tak cukup layanan, gamaknya. Atau seorang isteri yang dipukul dan lebam-lebam datang ke jabatan kecemasan kerana cedera didera suami. “Afiza, saya selalu perasan lelaki Melayu selalu marah-marah isteri depa. Selalu kena buli. Awat ek? Memang perempuan Melayu macam tu ek?” Seorang houseman berbangsa Cina pernah bertanya pada saya. “Macam tu? Maksud you, macam mana?” Saya memang tak faham apa yang dia cuba maksudkan. “Eh taklah. Mana ada perempuan Melayu selalu kena buli dengan laki. Mak aku ok ja. Aku ni Melayu gak; Hang rasa ada ke orang berani buli aku. Boleh ke?” Itu jawapan saya. Tapi dalam hati berkerut kesal; awatlah pakcik ni bebal sangat! 4)Wanita yang dicabul atau dirogol – oleh muhrimnya atau yang bukan muhrimnya. Sampai mengandung. 5) Isteri yang kematian suami akibat nahas jalan raya– tiada tempat bergantung lagi. Tak pernah bekerja sebelum ini dan tidak tahu bagaimana mahu meneruskan hidup tanpa suami. “Abang akak kan ada. Mesti dia boleh bantu.” Doktor memberikan cadangan. “Okay. Erm…Bapa saudara belah ayah atau belah mak? Anak saudara lelaki? Erm…cousin lelaki yang baik hati ke?” Doktor pun dah macam ‘desperate’ dalam memberikan buah fikiran. Run out of option! Semua tak boleh harap; semua tak boleh jalan. Di mana tanggungjawab seorang lelaki di dalam sebuah keluarga? Yang kau dapat pembahagian harta dua kali ganda tu, kau ingat saja-saja ke? Amboih! Habis tu, hadis yang kata “Sebaik-baik lelaki adalah yang paling baik terhadap isteri” kau lupa pula? Saya memanglah hangat hati bila jumpa kes-kes macam ni. Ringan saja mulut ni nak mencurahkan leteran tapi bimbang tidak mampu mengawal emosi. Seorang doktor di jabatan psikiatri lebih-lebih lagi didedahkan dengan masalah sosioekonomi pesakit. That’s our bread and butter. Setiap petang Rabu, lambakan kes-kes tangkapan dadah akan dihadapkan kepada kami untuk disahkan ketagihan mereka. Hampir kesemuanya lelaki. Malah, setakat saya bekerja di jabatan ini, semua kes yang memerlukan saya mengesahkan ketagihan adalah dikalangan lelaki. Kesemuanya sekali! Mahu saja saya menambah: Awak tak payah jadi lelaki lah. Tak guna bersembang bagai nak rak sekiranya kita tidak mempunyai solusi untuk menyelesaikan dilema masyarakat kita. Ingatlah. Membentuk anak lelaki menjadi lelaki yang bertanggungjawab adalah agenda utama keluarga. Tetapi masyarakat kita mempraktikkan sebaliknya. Anak lelaki dibiarkan bebas tanpa tanggungjawab. Boleh keluar masuk rumah sesuka hati. Balik lewat malam pun setakat dileteri sahaja. Tiada usaha tegas untuk membentuk jati diri mereka. Tidak seperti anak perempuan, anak lelaki langsung tidak diberi apa-apa tugas di dalam rumah. Tapi markah peperiksaan sikit punya lemah. Sebab di luar, ketagih dengan dadah. Anak perempuan pula dikongkong ketat. Mesti duduk rumah. Nanti jadi apa-apa, kang susah. Dok kat rumah, tolong mak masak, basuh baju, sapu sampah, basuh pinggan. Jangan lupa bila abang kamu balik, panaskan makanan untuk abang. Anak lelaki mesti ditatang-tatang. Baguslah kamu dapat nombor satu dalam peperiksaan, nanti bila dah berjaya boleh tolong mak dan bela abang. Come on lah! Mindset yang menyatakan membela seorang anak perempuan lebih susah daripada membela sekandang lembu adalah mindset lapuk yang ketinggalan zaman! Membela anak perempuan ni hanya susah sebab takut mereka mengandung kalau terlanjur. Tu jer kot! Tapi tak ada siapa kisah bila anak lelaki merosakkan anak dara orang sebab mereka secara biologinya tidak boleh mengandung! Itu saja perbezaannya membela anak lelaki atau anak perempuan. Dari segi jasa kepada ibu bapa, kedua-dua jantina boleh berjasa jika mereka mahu. Dari segi berbakti kepada ibu bapa, anak perempuan lebih ke hadapan membantu kerja-kerja rumah. Dari segi berjaya dalam pelajaran, itu sudah tidak perlu dibincangkan. Sudah nyata lagi tersuluh! Jadi janganlah ada standard yang berbeza dalam menguatkuasakan undang-undang di dalam rumah. Jika anak perempuan tidak boleh pulang ke rumah lewat daripada maghrib, maka anak lelaki juga begitu. Jika anak perempuan diberi tugas membantu di dapur dan di dalam rumah, maka berikan tugas kepada anak lelaki untuk membantu di luar rumah. Biarkan anak lelaki diberikan tugas membuang sampah di luar rumah, menjirus bunga di halaman rumah. Ini lebih sesuai kerana anak lelaki tak perlu menukar baju dan memakai tudung ketika keluar. Biarkan mereka menjadi penyambut tetamu di pagar rumah sementara memberikan masa bagi ibu dan anak-anak perempuan menukar baju dan memakai tudung untuk bersedia menyambut tetamu yang datang. Ini lebih afdhal. Berikan tugas-tugas yang berat dan kotor kepada anak lelaki. Cuci bilik air, that’s their job! Mengalihkan perabot-perabot yang berat, menukar tong gas, kerja mereka juga! Menggapai tempat-tempat yang tingggi (seperti menyapu sawang), that’s their job! Tolong jangan mendidik anak-anak lelaki supaya boleh sesuka hati mengarah anak-anak perempuan kamu. Jangan suruh kakak iron baju abang. Jangan suruh adik perempuan kemaskan bilik tidur abang. Biarkan mereka bertanggungjawab menjaga baju dan bilik sendiri. Tidakkah kamu risau anak perempuan kamu berkecil hati? Ini kan common sense! Itu bukan alasannya. Kalau dia tak iron baju dia, biar dia pakai pakai baju berkedut pi sekolah. Lama-lama dia retilah buat sendiri. Kalau dia tak kemas bilik dia, biar tikus bersarang sekalipun, dia akan kemas sendiri bila dia tak tahan. Tapi, jangan diajar memanjakan. Sebagai ibu, pandai-pandailah awak guna kuasa mengajar anak lelaki. Takkan tak reti? Hiys, aku memang pelik lah kalau ada budaya macam ni lagi. Mungkin di kampung kot, bila ada kenduri-kendara, masih apply lagi budaya ni! Zaman sekarang, dah tak boleh applikasi konsep macam ni. Kita taat kepada suami kerana Allah. Bukan taklid buta, ya! Isteri ada hak ke atas suami sebagaimana suami berhak ke atas isteri. Itu hukum! Fakta! Di zaman sekarang, adalah sangat tidak selamat untuk seorang isteri berhenti kerja. Ini juga fakta. Ini juga statistik. Saya tidak bercakap kosong. Jika berlaku perceraian, isteri terkontang-kanting tiada arah tujuan. Dapat suami yang baik, nafkah anak-anak mungkin diberikan. Tapi belanja diri sendiri bagaimana? Siapa yang mahu ambil seorang wanita tua yang sudah lama tidak bekerja untuk kembali bekerja di syarikat mereka? Lebih baik mereka ambil orang muda yang kurang berpengalaman daripada mengambil wanita tua (yang juga kurang berpengalaman!) That’s basic decision making! Jika si isteri yang diceraikan mempunyai abang-abang yang bertanggungjawab untuk menyara dirinya, Alhamdulillah. Tapi jika si abang sendiri kais pagi, makan pagi…macam mana? Atau lebih teruk lagi, si abang di pusat serenti, bagaimana?! Pada masa yang sama, bapa saudara pun buat tak tahu…tiada siapa yang mahu ambil tanggungjawab terhadap perempuan lagi! Mereka tidak merasakan mengambil tanggungjawab terhadap perempuan sebagai sesuatu yang ‘honourable’ tetapi lebih kepada ‘trouble’. Kedudukan perempuan yang tidak bekerja sangat tidak selamat di zaman ini! Saya bukan seorang yang feminist. Jauh lagi pesimis! Saya bercakap mengikut fakta zaman ini. Kerana begitu ramai sekali kes-kes sebegini yang kita lihat. Kita perlu praktikal. Wahai suami-suami yang memaksa isteri berhenti kerja, Sungguh pun kamu yakin kamu tidak akan menceraikan mereka dan akan sentiasa menjaga mereka sehingga ke akhir hayat, bagaimana jika hayat kamu itu pendek? Yakinkah kamu bahawa abang-abang kepada isteri kamu akan menjaga anak-anak kamu …mampukah mereka membelanjakan hasil titik peluh mereka menyara anak-anak yang kamu tinggalkan di dunia ini jika isteri kamu tidak bekerja? Atau yakinkah kamu bahawa adik-beradik kamu sendiri akan menjaga anak isteri yang kamu tinggalkan dan menyara mereka sebaik-baiknya? Jika kamu tidak yakin, izinkanlah isteri kamu bekerja. Masih lagi mahu berhenti kerja? Suka hatilah. Okaylah. I rest my case. Buat kakak-kakak ipar, biras dan sebagainya. Tolong sokong suami kamu jika dia mahu mengambil tanggungjawab menjaga adik perempuan atau kakaknya yang memerlukan bantuannya. Come on! Jangan tikam belakang kaum sendiri! We are all women! Jika kamu sendiri mempunyai masalah, sudah tentu kamu mengharapkan ihsan ipar-duai juga, kan? Sekurang-kurangnya, untuk menolong kamu sementara kamu mencari tapak untuk berdikari semula. Jangan dengki, jangan jealous. Kesianlah kepada kaum sendiri. Saya minta maaf jika luahan kali ini membangkitkan rasa tidak puas hati mana-mana pihak. Samada kaum lelaki mahupun kaum wanita. Bukan ingin memperlekehkan lelaki zaman ini. Memang ramai lagi yang bagus! Jangan anggap ini isu feminism. Tolong jangan mengambil pendirian sebegini sempit! Ini isu isteri kamu. Isu anak perempuan kamu. Isu kakak dan adik perempuan kamu. Kerana sebagai lelaki, isu isteri kamu, anak perempuan kamu, kakak dan adik perempuan kamu…adalah isu kamu.